Hammers & High Heels: Top 10 Posts of 2010!!! Can You Guess #1??? WOW! We can't believe how fast 2010 has gone by! We decided it would be fun to list out our top 10 favorite posts of the past year (and of all time really since this is our first year blogging). These really are our favorites, some match back to our 'Popular Posts' list and some are just the ones that we still look back at and cringe or laugh out loud at. Can you guess #1? This DIY Decor Project was my favorite of the past year. I loved that I was able to take something original to the house that was just stuffed down in our basement and tranform it into something lovely that we can enjoy. Our chalkboard is now in our kitchen nook. We love writing fun notes to each other on it or holiday messages. Even better than that is when our guests leave a message when they visit. Now I have to decide what I'll do with the other antique windows and doors in the basement! Boy, our kitchen nook was quite the cluster when we moved in! Who likes a small space with giant cabinets?!? This project was very multifaceted! Even when we thought we were done, it kept changing and evolving into what we have now. 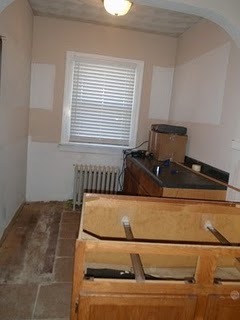 This project included cabinet removal, painting, tiling, hanging new cabinets, creating an antique chalkboard, adding a new butcher block table top, and finally sanding and refinishing a table and three stools. I cringe to think of how many total hours went into making this small and unique space look the way it does today. 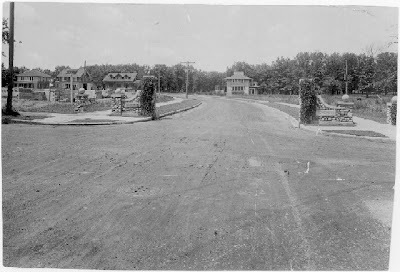 How wild is it to get a glimpse of what your neighborhood looked like almost 100 years ago? I loved every second of researching our neighborhood's history. I like to think that in order to know where things are going you have to know where they have been, and this neighborhood has been through a lot! Everytime we walk the neighborhood and see those stone pillars it is fun to know the story of why they are there. I love our neighborhood and neighbors, like I said, I can't help but be passionate and hopeful for NOMI and now we are apart of the story! I was so excited to have the chance to decorate a room outside of our house, even better it was for our cute little nephew, Henri! It was fun to look at the space, budget, research ideas, and then decor shop for a whole room. The best part was when my sister in law told me that Henri just kept pointing and giggling at all the new things in his room. To me that meant he loved it! #6: Bathroom Redo #2 is Complete! 'After' Pictures! Posting 'after' pictures of a project is definitely the best part. We like this post so much because this was the first time we did a great job documenting our progress along the way with this bathroom redo (which was a redo of our first redo). This bathroom also used to be one of the rooms I was most embarrassed of in our house since the floor was deteriorating. So happy Alex surprised me by tearing it up! Clearing all the plants and woodchips in our backyard was the WORST PROJECT that we have worked on... EVER! To review everything that we went through in order to plant some darn grass in our yard so the dogs could run and play click here. This post is memorable to us because we still look at that 'before' photo of our backyard and say 'holy crap'! It was soooo bad! We also still laugh out loud when we look at this picture of Alex trying to burn our yard waste... why? Well, we found out it is very illegal, so don't do what Alex is doing. You will also scare your neighbors. Alex and I loved comparing our first experience cutting down a real Christmas tree to the first scene in 'National Lampoon's Christmas Vacation'. It was so much fun finding our perfect tree and cutting it down clad in lumberjack flannels together. The blog was just so fun to write, we giggled the whole time, totally a classic! I love, love, LOVE this post. When you live in a very old home, you wonder what story the walls would tell if they could talk. After contacting a very helpful man by the name of Ian Stade at the Hennepin County Library, I got to learn some of the story of our old house. The image below is the original building card which is framed at the base of our staircase. In the link above you will also find copies of the US census for the first two families that lived in our house. Your home is a huge part of your life and what you take pride in so I love knowing the history of the little house Alex and I are trying to bring back to life. Numbers 1 and 2 were a little tough to pick, but stair sledding landed at #2. This was absolutely the craziest thing we have done in our house, but holey moley it is by FAR the most popular Hammers and High Heels blog post ever! Click the link above to watch the nutty and hilarious videos of Alex and I sledding (and screaming) down the stairs just like Kevin McCallister did in 'Home Alone'. What made this even more amazing though was being featured on Hooked on Houses, one of our favorite major blogs! This picture just cracks me up! Doesn't Alex look just like a little boy... with a beard, haha! This was definitely the best blog moment for us in 2010 so we are going to go into a little more detail. Alex and I were fans of Layla and Kevin's blog The Lettered Cottage even before we bought our house. Once we moved in, we got tons of DIY ideas from them for our little Dutch Colonial. It was so crazy and random that we got selected to go Junkin' at Junk Bonanza with them AND have them redo our guest room. Part of our room redo and junkin' adventure was that Layla and Kevin were shooting a potential TV show. So naturally with Alex and I being TV and movie geeks we were very Oooo-ed and Awww-ed at the camera, boom mic, and lighting set up in our house. We also got to do a bit of acting which was pretty hilarious! Here's a photo from the Junkin' experience at Junk Bonanza. It was so weird walking around with a camera following us, it was a great bargaining tool though :) Alex and I can't wait to go to Junk Bonanza again next year! After all the fun shopping Layla and Kevin got to work and made our guest room beyond perfect! One thing you might not know (and this is also why it ranks up at #1), Alex and I almost gave up on this blogging thing around August. If you look at our posting frequency, we only did 7 in July then 3 in August. We just chalk it up that fate decided our favorite blog couple needed to come by and inspire us to keep on our blog journey. Blogging and working on our house has become my new favorite hobby and I am very thankful for all the new friends we have met through blogging. This blog has definitely brought some fun and pride to all the work Alex and I do on this old place! In closing, I can't believe how wonderful and blessed 2010 has been! So cheers to all the hopes, dreams and adventures ahead for 2011! 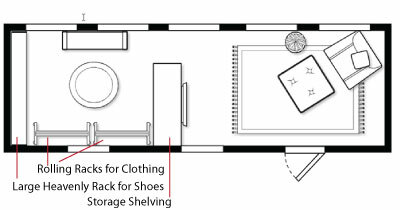 It has been a while since we last wrote a super crazy confusing post about our plan for the Spare Room off our Master. Well, here is the official game plan for the space Alex and I have agreed on (I even made him shake on it to make it official so we can finally get started). As you can see, we decided to break up the long space into a sitting room and dressing room. We are sort of trying to create a whole master suite, minus our own bathroom of course, we aren't up for that much destruction construction. But having a lovely sitting space off our master and a ton of new storage space is a major bonus! So now that we have shared the floorplan I wanted to put together some images of what we are thinking of for the dressing room. 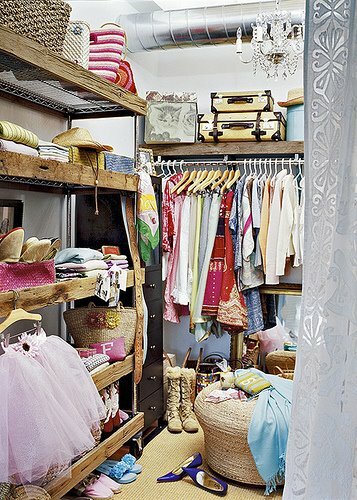 Well, really this is what I was thinking of, the dressing room will be all for me (lucky me, finally getting a dreamy closet!). Alex will get to take over the existing closets in our master. So here is the inspiration for my dreamy dressing room/ closet- with the exception of the color schemes/ decor- that will come later. This image was featured the November 2008 Domino Magazine (sad, remember Domino magazine?). It is Jenna Lyon's (SVP of Design at J Crew) dressing room in her lovely Brooklyn Brownstone. 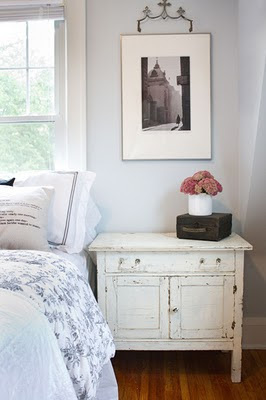 You can take a look at the entire home on Habitually Chic. I love that it still feels like a room and not a closet with built-ins covering each wall. Which might be a good idea for our room since it does have windows and doesn't feel very closet-like. I love the open industrial fixtures for her shoes and rolling racks for her clothing. Here is another that feels more like a room and not a closet with the open industrial fixtures. This image was found on Where the Style Things Are. It looks so fun, but again these pictures aren't my inspiration for the decor/ color scheme of the room (no thank you to the zebra rug)! This one is from Desire to Inspire. I love the rustic wood trim attached on the rolling rack. I really think the rolling rack and open fixtures will be a perfect look for that side of the room. Maybe I'm also drawn to the rolling rack idea because it reminds me of my college days, we had rolling racks in our apparel construction and design rooms. So...we are ready to get going now that we know our plan for the layout, flooring, shelving and rolling racks! Next we just need to figure out the decor and color scheme of our master bedroom since we want the whole space to coordinate. I can't wait to post our master bedroom inspiration soon, we have waited 2 whole years to do this! So much to think about, I sort of go cross-eyed when I try to piece all the details together in my mind, but I can't wait to get started and make these ideas reality! *** PS! If you haven't noticed, we are on Facebook finally! Check the top right corner of our blog and hit 'Like' to see our page! We will try to update with our latest status in our home adventures! Just wanted to post a quick blog before all the fun starts today. Alex and I hope everyone is enjoying the holidays, I know we are! Just take a look at our lame Christmas themed sweaters! Aren't they great?!? Anyway, Merry Christmas to all of our blogs friends! Ho! Ho! Ho! Our 'Home Alone' Sledding Adventure is Featured on 'Hooked on Houses'! Check it Out! We are so excited! 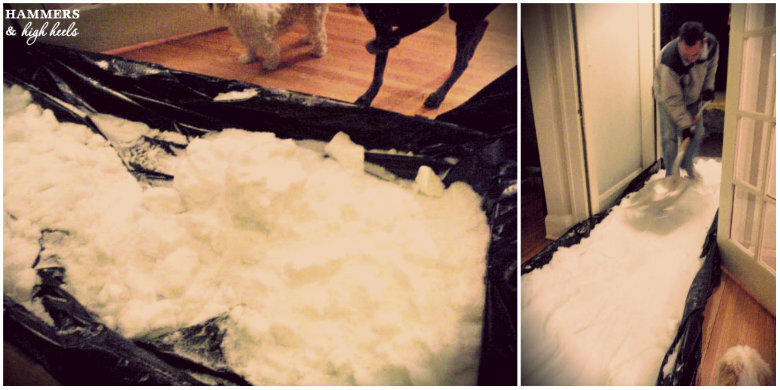 One of our favorite Home blogs 'Hooked on Houses' featured our 'Home Alone' Sledding Adventure today! Julia writes about all things home, but our favorites are her features about TV and Movie houses! Check out Julia's post here: Have You Ever Wanted to Sled Down the Stairs Like Kevin Did in "Home Alone"? If you are a new visitor to our blog linking from Hooked on Houses be sure to check out our House Tour and let us know what you think of our progess so far! 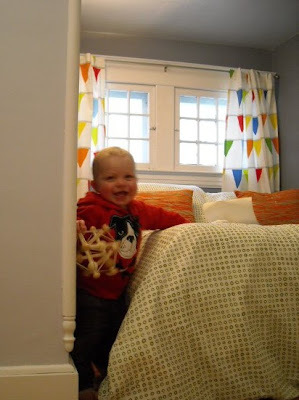 We know our stair sledding was fun (and a bit on the crazy side), but our main focus and commitment has been on renovating our little 1924 Dutch Colonial! Happy Holidays! We're glad everyone loved our 'Home Alone' stair sledding, but our game faces are back on and we are getting back to work! Remember this little beauty? Well I guess I can't say beauty, but here's to hoping we can make it happen! I picked this up a while back when I went antique shopping in Stillwater.﻿ As I discussed in that blog, I had been looking everywhere for a stool like this, because it's just like the one my grandma had. The upside of this find, is that I got it for only $24 bucks, but it looks like this is going to take a lot of work to restore it. Oh, and I know Christmas is only 4 days away, but I was itching to start this since its been sitting for 2 months now. Here's a gratuitous﻿ close up of just how badly rusted it is. Don't worry, I recently had a tetanus booster, ha! Since I was wondering what this stool has been through, I googled the brand 'Cosco' that I found on the foot step. Easily, I discovered why these stools are so special! 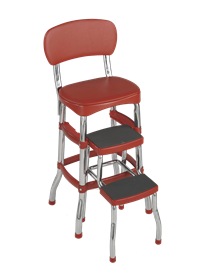 Cosco was founded in 1935 in Columbus, Indiana and in 1941 introduced patented all-metal kitchen stools; the first full line of household stools manufactured by one company. So that is where this style of stool came from which makes sense, maybe my grandma got one after my grandpa came back from WWII to put in their home? My mom even said she remembered that stool from when she was little as well. So, we went down into Alex's workroom/ bike lair in the basement and I got to strippin' off the rust! Check out the close up action, see all that shiny metal being uncovered?!? Alex scolded me for not holding it level a couple times so as usual I let him take over and got back to photographing our adventures. (PS he ended up putting on goggles, that tool shot stuff all over the place, if you use it wear googles!). Glorious shiny metal! Can you believe it?!? Thankfully, solid metal under that rust! We will keep you posted on the progess, but this will likely take as much painful sanding as my table and 3 stools.﻿ Also, not that we're dragging our heels (ha, heels!) on the projects we are working on, but we might have to wait until Christmas craziness is over before we can get any big projects done (which will be hard for me, I LOVE blogging!). We hope everyone is enjoying their holiday season fun and festivities! Make up your own tradition like we did this year! Yep, this is crazy and not very 'grown up' of us, but we HAD to do it! Plus, we need a little fun since we have been stressing over the Mini Bathroom, Spare Room Redo, and Christmas shopping. Alex and I were 6 years old when the first Home Alone movie came out and like every kid, we just LOVED it! What kid didn't want to be as cool and clever as little Kevin McCallister outsmarting robbers and setting up a house full of traps? Most importantly, what kid didn't want to sled down their staircase and out the front door? What a great idea! A while back I blogged about how much I loved the Father of the Bride House because of the traditional layout and center staircase at the entry. The McCallister house from Home Alone has the same characteristics. You can see a really detailed view and some behind the scenes facts on Hooked on Houses (fun fact- they made that whole house red and green colors in every room to give it an overdone Christmas feel?). 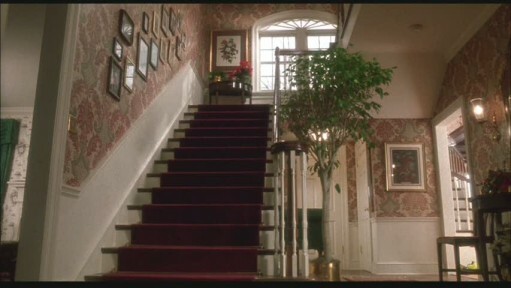 I really think the reason I wanted an older colonial style house is because of all those movies I watched growing up... Grand center staircase at the entry, detailed woodwork, classic light fixtures, doors, windows... just so warm and charming! Our staircase is of course not as large and grand, but still has a similar look and feel. So, 20 years later (did you know it was the 20th anniversary for Home Alone?) Alex and I are making that childhood dream real! A few days ago, one of Alex's coworkers mentioned how cool it would be to have a house where you could sled out the front door like in Home Alone. Alex said, "I have a house like that" and the idea was planted! Once he mentioned it to me I told him that it was an awesome idea (much to Alex's surprise) but yes, just a little crazy! To do this without completely destroying our hardwood floors and stairs (we have put a TON of work into our little house), we may have gone a little overboard with our protective set up to protect for Operation Home Alone: House Sledding.﻿ Just like in the movie, there is about 12 feet of level ground from the end of the stairs to the front door, therefore we had to use snow (yes snow inside = crazy) to create a slick surface to make it out the front door. Realistically, Kevin never would have made it out of the front door once he hit that rug and wood floors at the bottom of his stairs, gotta love the magic of Hollywood! Then he started securing the sheet plastic with trusty blue tape and a couple of staples into the wood boards. 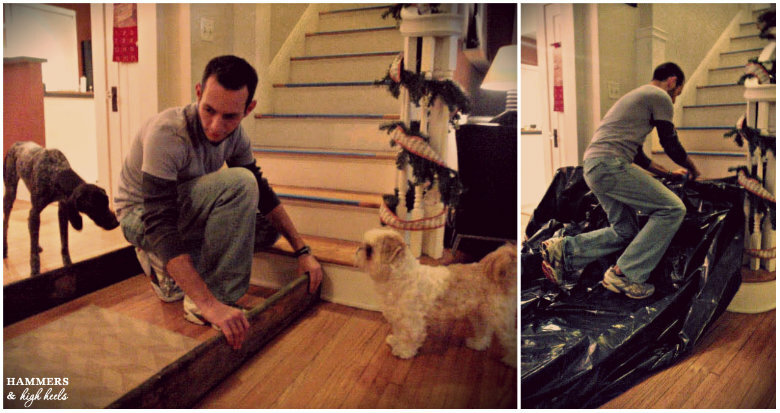 We also put layer of blue tape at the edge of each stair to protect them from the bottom of the sled. Our sled was plastic as well, not metal like the movie, but they also had a runner down the stairs and a much larger budget (sadly, a special effects crew wasn't in our budget). Then the snow came in (our poor dogs were very confused)! I was freaking out a lot little, but stood by with several rag towels to sop up any melting snow that hit the floor.Once we had a good amount inside, Alex packed it down and smoothed it out with a shovel. 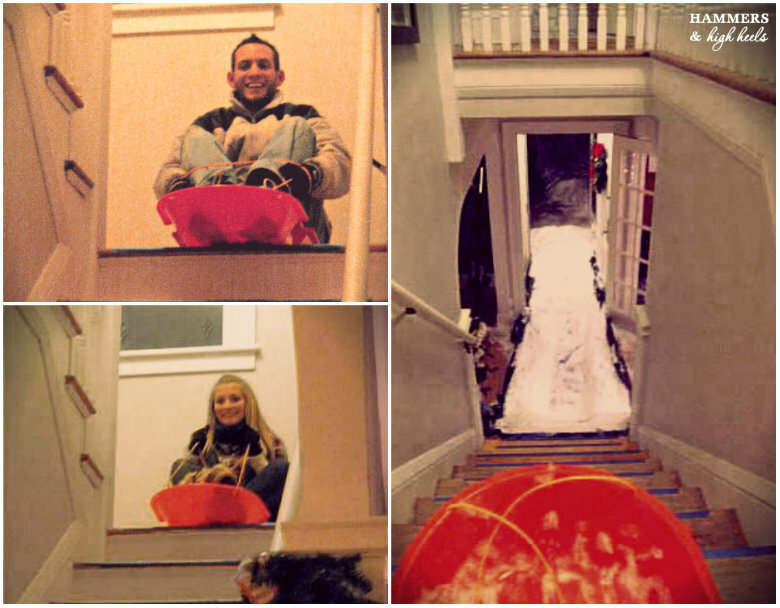 Then it was time to sled down the stairs! Here is my little 'Kevin McCallister', Alex was REALLY excited to do the first test run. Then I got one of Alex from outside. I wonder if our neighbors saw what was going on? We both took two trips down and then called it quits since it was pretty cold and we were still a little nervous about the snow in the house. Fortunately it didn't take too long to clean everything up, and then we got to watch our little videos, which were hilarious! I hope you enjoy them! I realize this was crazy, but honestly I think that might be one of the best memories we will have in this house (thankfully a contrast from all the DIY work or the 2011 Tornado experience).﻿ We both agreed that this was a stunt that our parents would have never allowed, but one that we will never forget! I also have to give my hubby a shout out for setting this up AND for always being a 'kid' with me, I'm very thankful for that! *** UPDATE! Our little adventure has been featured on Hooked on Houses! Check it out!